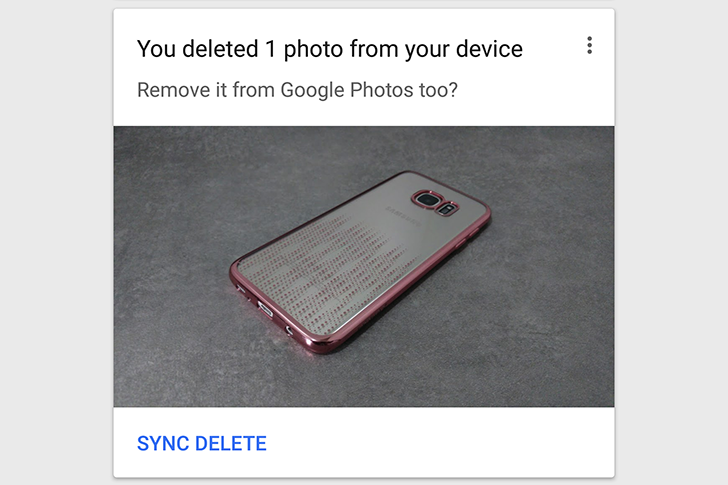 Google Photos is still trying to find the best ways to reconcile between your locally stored photos and your cloud photos in the most seamless and least intrusive way. Over the year since its launch, it made deleting photos, from inside the app itself, simultaneous between cloud and local storage. Then it made it possible to empty your phone's storage if you've already backed up photos, so you don't run out of space on your phone. And now there's a new feature that's been popping up since the latest update to version 1.23 of the app that offers to sync deleted photos. Say you took a few photos on your phone and they're already backed up to Google Photos. Then you went through another gallery app (if you use the Samsung or LG or HTC Gallery apps or another third-party client) and deleted the ones you didn't want to keep. The images would still be backed up in your Google Photos account. Now, Photos is smart to realize that this has happened and suggests it removes them too. For example, you may want to do that for burst photos that you don't want in your account or for random shots that you only needed for a couple of days. But you don't want to do that for photos that you want to save but just removed because you're freeing up space on your device. That's why it's great that this is an optional card and not an automatic action. Now I'm going to sit and pray that someone fixes the duplicate cloud/local Photos issue on the Galaxy S7/S7 Edge, and that Google Photos finally adds a smart duplicate detection algorithm to suggest removing similar but not exactly identical photos.